John Royal's MLB Playoff Predictions: Satan Is Our First Base Coach, Go D-Backs! Yankees versus Indians. Red Sox versus Angels. Diamondbacks versus Cubs. Rockies versus Phillies. The playoff pairings were finalized Monday night after the Rockies defeated the Padres in 13 innings to win game number 163 of the season. And while MVP candidate Matt Holliday missed the bag when sliding into home plate, the umpire decided that God’s Team was the more deserving and called him safe, allowing the Rockies to advance. So, how are the playoffs going to play out? I don’t know if I’m really the person to ask. You guys read my predictions before the season started. I had the Mets winning the NL East, the Brewers winning the Central, the Dodgers winning the West, and the Braves getting the Wild Card. I said the Phillies would finish in third. That the Cubs would finish in third. I had the D-Backs in second, but the Rockies in fourth. That’s a real winning record. Hell, even Jose de Jesus Ortiz did better at predicting the NL playoff teams than I did. And I was just as bad when it came to the American League. I had the Yankees winning the AL East. The Tigers in first in the Central, and the A’s finishing in front in the West with the Twins as the Wild Card. I had the Red Sox coming in third place, the Indians in fourth place, and the Angels in second place. So, I did a little better with the AL and got one team right. But I had the Tigers beating the Mets in the Series. The Rockies are the hottest team in baseball, having won 14 of their last 15 games to win the Wild Card. They have a surprisingly good pitching staff, a wily veteran at first base, a speedy and powerful outfield, a potential MVP, a potential Rookie-of-the-Year, and Gold Glove quality players at third, short, left, and right. And they’re the Wild Card team. If we’ve learned nothing else the past several seasons, it’s to never count out the Wild Card team. The Tigers, Astros, Red Sox, Angels, and Marlins, are just some examples of recent Wild Card teams to advance to the World Series. And I’m really tempted to pick the Rockies. It’s a nice city. A fantastic stadium. And the team’s been built by the farm system and shrew trading. 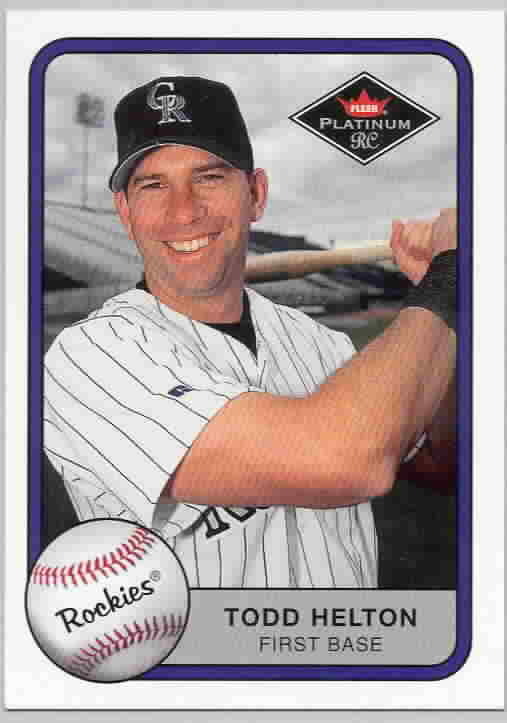 But then I discovered that the Rockies owe this advancement to the playoffs to God. That’s right. God is guiding the Rockies. He is their co-pilot. Now, one would think that God was busy with Jon Kitna and the Detroit Lions. But evidently, God’s powerful enough to handle both teams. I guess that it’s silly of me to expect God to handle such minor things as the war in Iraq, famine in Africa, AIDS, curing cancer, or doing something about the travesty that is the Bush Presidency. Not when He’s got to spend His time handling the Rockies and Lions. So, that said, I’m not picking the Rockies. I’m going against God. I’m taking another team. A team’s that flown underneath the radar all season. And I’m making this team the team of The Flying Spaghetti Monster. And with The Flying Spaghetti Monster behind them, there is no way that my pick as the team of destiny can be stopped. Ladies and gentlemen, say hello to the Arizona Diamondbacks, your World Series champions to be. The D-Backs have flown under the radar the entire season. Randy Johnson’s been on the DL most of the season. Their best player is second baseman Orlando Hudson, who’s been out for the past month with a season-ending injury. The Big Unit’s also out for the season and playoffs with an injury, as is third baseman Chad Tracy. The D-Backs start four rookies in short stop Stephen Drew, centerfielder Chris Young, and right fielders Justin Upton and Jeff Salazar. The D-Backs team batting average is .250, the lowest in the NL, and the highest average among the regular starters belongs to left fielder Eric Byrnes at .286. Yet this team finished with the best record in the National League. The D-Backs play the Chicago Cubs. You know, I don’t really like the Cubs, but way back in 2003, I was actually kind of pulling for the Cubs to make the World Series. I thought that if the Cubs actually did make the Series that their obnoxious fans would shut up. But I thought that would happen with the Red Sox fans. I thought the Red Sox fans would shut up after 2004. Boy was I wrong. The only fans more insufferable than Yankee fans are Red Sox fans, and I see the Cubs fans becoming like Boston fans if they go to the Series. And we really don’t want that to happen. The Cubs have a very good manager in Lou Piniella, who guided the Cincinnati Reds to one of the biggest World Series upsets in history. Alfonso Soriano has performed as advertised. But the pitching has been spotty, and the Cubs are here not so much because of outstanding play at the end of the season, but because the Brewers collapsed. The Phillies are just as hot as the Rockies. It took more than just a collapse by the Mets for the Phillies to advance. The Phillies actually had to win some games when it mattered. The Phillies can hit and are led by Jimmy Rollins, Ryan Howard, and Chase Utley. But the Phillies pitching is weak, and the Rockies are riding the high, so I’m taking the Rockies to advance to the NLCS where they will lose to the D-Backs. Over in the American League, I’m going to have to pick the Red Sox to beat the Angles. While I don’t like it. And while I think Mike Scioscia’s one of the best managers in the majors, I don’t think the Angels can pull it off. Not when their best player, Vladimir Guerrero is injured and relegated to DH duty. And while the Angels have fantastic pitching, I think the Red Sox starting staff is even better. The good news is that the Yankees will be beat by the Indians, making for another first round playoff defeat. The Yankees pitching has been suspect all season. And I think the Indians just want it more – yeah, that’s quantitative analysis isn’t it. The Indians will upset the Red Sox and meet the D-Backs, and the D-Backs, backed by The Flying Spaghetti Monster, will win it all.